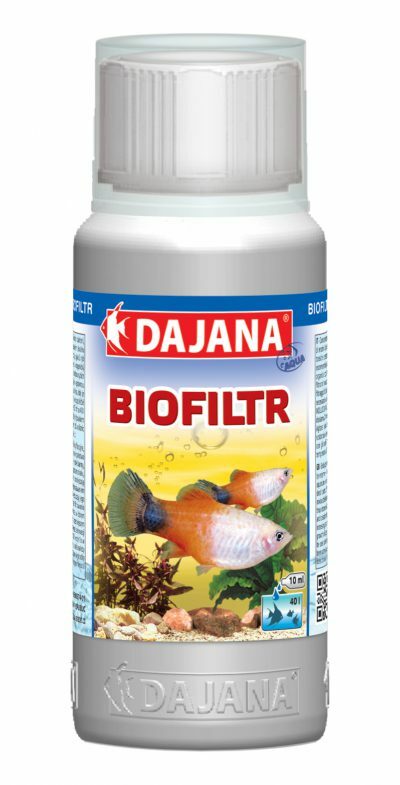 Biofilter | DAJANA PET, s.r.o. 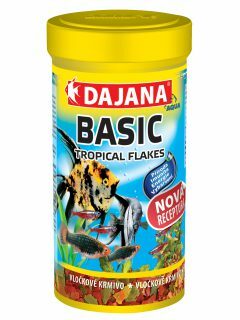 Live denitrification bacteria – a biological filter for your aquarium. 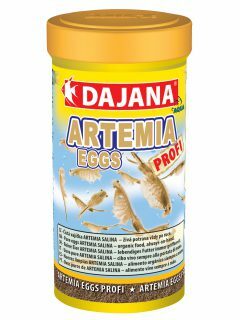 By using this agent you fill your aquarium with millions of live bacteria and enzymes which are important elements of the ecosystem of your aquarium. 20 ml per 40 l water first time, later only 10 ml per 40 l water 1x per week. Use after applying MOLUCID, ALGICID or after larger treatment of your tank. An agent containing denitrifying bacteria. This solution is used to supply millions of useful bacteria and enzymes into aquarium water; they form an extremely important part of the ecosystem in your aquarium. The agent contains selected species of natural bacteria which produce enzymes. These bacteria feed on organic waste which is the source of nutrition for their growth and reproduction. Through complex chemical reactions, organic waste is metabolized to water and carbon dioxide. Under ideal conditions, the bacteria propagate very quickly and they produce a new generation every 20-30 minutes. The number of the bacteria increases in a geometrical ratio, until the source of nutrition is exhausted or until there is a major change in aquarium conditions (such as a significant change of pH or a considerable depletion of oxygen which the bacteria vitally need for their reproduction). 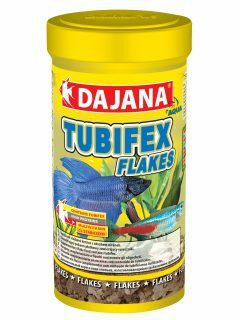 Also, abnormal use of chemicals in your aquarium, for instance during some treatment of the fish, may suspend the growth of plants temporarily or it may even eliminate the bacterial culture overall. Enzymes are supportive chemicals (catalysts) which break down complex molecules of waste substances into smaller pieces which may then be digested by the bacteria. Enzymes are inanimate, they do not grow or propagate; they are produced by bacteria. They may be divided into four groups which break down fats and lipids, proteins, cellulose, carbohydrates and starch. Special nutrients are added into the product to provide for the supply of vitamins and minerals, as they do not have to be present in polluted water and their shortage could influence the bacterial function. Biofiltr should be applied into functioning aquariums always after serious interventions, such as thinning of plants, netting of fish (this always involves swirling of the bottom), treatment by agents disrupting the aquarium biorhythm, replacement of old filtration media etc. Let us look more closely at the last instance. It is strongly recommended to take the following measure: in case that you use inner turrical filters with at least two sponges and you want to replace them, change only one sponge and keep the second one which contains the bacteria. Only after the new sponge is inhibited by the bacteria (which takes about 1 week in a decorative aquarium), replace the second old sponge with a new one. In case of excessive presence of infusorians (milky-coloured water, cloud-like formations of microorganisms), never attempt to eliminate them by changing the aquarium water. This would lead to an opposite result. If you have several tanks at your disposal, discharge the infested one and refill it with water from another aquarium, which is in order. 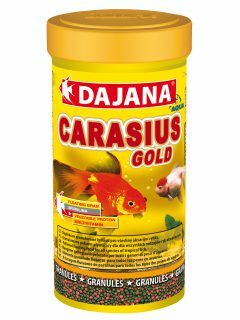 If you cannot use another aquarium, apply appropriate doses of ALGICID and ACRIFLAVIN, and add common salt into the infested aquarium, in order to support the growth of protective mucus on the fish. Remember that salt is not tolerated similarly well by all species of fish! None of the recommended agents should seriously harm the denitrifying bacteria, it may merely suspend their growth for several days. It will also not harm the aquarium fish. Once the filtration media start working properly, the infusorian culture will be eliminated. As regards external filters, it is recommended to replace individual parts of filtration media gradually. Biofiltr is also very useful for outdoor decorative ponds, because their occupants (mostly cyprinid fish with large quantities of excrements) provide rich nourishment for the denitrifying bacteria. Use this agent in water with a pH of 6 to 9 and a temperature of 10°C to 40°C. Observe basic hygienic rules when using this product.